Public Speaking, Web Development, Copywriting, Full Video Production, Sound Production and Editing. Tom Haig is a multi-talented communications specialist with a wide array of skills and clients. Tom has experience with nearly every facet of the communication business. He has been developing websites since the dawn of the Internet and written copy for international corporations, large universities and small businesses. He spent six months launching a Tibetan radio station in the Himalayas and lectured at medical colleges, conferences and hospitals all over the world. He has shot, edited and produced videos on four continents in English, French and Nepalese. Currently, he’s a consultant, most notably for the International Rehabilitation Forum, an organization focused on addressing global medical rehabilitation issues. He is also a public speaker on transportation and disability topics. 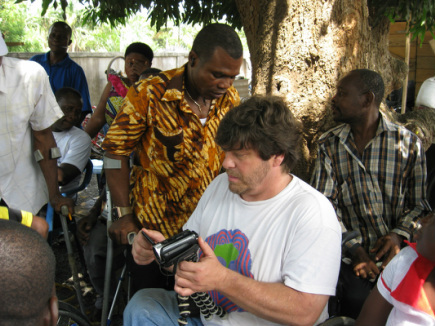 Monthly meeting of the Ghana Society of the Physically Disabled.